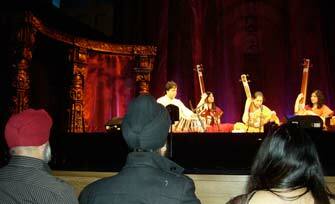 Please remind yourself first of our reviews of Darbar Festival 2009 London at South Bank Centre. 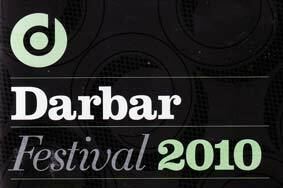 Darbar 2010 transfered to Kings Place for the Easter weekend, the weather this year still inclement. The festival atmosphere was lively, with fairly good attendances through the four days, though none of our concerts was sold out. No press festival passes were issued, but we were invited to review the daytime events. So we missed the innovative 1st April first night composition Encounter, an attempt by Param Vir "to open up Indian classical music to contemporary western harmonic and instrumental practice, and to radically fuse raga melodies and tala time cycles with modern harmonic techniques". Pending Sky Arts 2 screenings in due course, see the last five-minutes on YouTube, with singers Patricia Rozario and Veena Sahasrabuddhe, violist Paul Silverthorne & Rohan de Saram cello. A "spin-off" of the press coverage arrangements was that we were able to give full attention to this year's new feature, the inclusion of several rewarding "conversations" and demonstrations aside from the main concerts. The theatrical background staging in the modern Hall One was no improvement on last year's at the Purcell Room, indeed to our eyes it was naff ("unstylish, clichéd, or outmoded"), with four columns each side, those under the corners of the gallery hiding a secret weapon, a loud speaker which, for listeners at the sides, diverted the sound from the performers sitting at the middle of the raised platform. I retreated from my allotted press seat there to a central position farther back where the sound was better balanced. However, for the first concert featuring Hari Sivanesan on veena, I found the amplification so excessive that for relief I donned my iPod earphone; another audience member told me later that she had tried using ear plugs, but these strategies entail losing overtones. Another fine experience was a well attended Saturday morning recital. The tireless khayal singing of the doyen Veena Sahasrabuddhe (b. 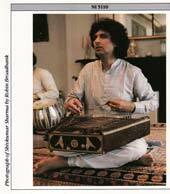 1948) was supported by tabla, harmonium and no less than three tanpuras, about which more later. Mr Singh received warmly my worry about the performance parameter of volume (q.v. above) as something needing to be addressed urgently by the Indian classical music fraternity, and afterwards audience members thanked me for raising this topic, which was giving widespread concern. And he also endorsed my suggestion that the Sky Arts films of the Darbar Festival 2010, yet to be prepared for TV (and hopefully DVD?) could readily be enhanced for Westerner viewers by provision of "red button" extras to define the notes of chosen ragas during the introductory alaps, and the beats of the percussion talas in the subsequent phases of the performances. Of the daytime "conversations" with artists performing at evening concerts, Pandit Shiv Kumar Sharma gave a fascinating account of the origins of his instrument from bow-and-arrow into various versions of the hammered dulcimer. His single-handed development of the santoor into a now recognised instrument for Indian classical music is a great story of inspiration and dedication; it is succinctly summarised in the insert booklet with Nimbus CD NI 5110 (1988) which I have long treasured [see an excellent 5-mins YouTube excerpt from that period]. Sadly, he did not have his own santoor with him for this session, nor make time for two of his advanced British disciples on stage to play for us more than a few notes. Carnatic singer/violinist Ranjani appeared without her sister and regular duo partner Gayatri (visa problems had bedevilled the festival!). She gave a marvellously spontaneous picture of a life immersed totally and single-mindedly in music since before she could remember, with early teaching from their mother. Both sisters sing and play violin, latterly Ranjani favouring singing to her sister Gayatri's accompaniment, they maintaining together a performing schedule at the highest level. In this session Ranjani gave us some insights into the particularities of the Carnatic traditions, leaving us sorry we had not been able to cover and enjoy her Friday evening recital. The famous dhrupad singing Gundecha brothers gave a quite militant session exploring the tanpura, the string instrument, usually fingered discreetly by women assistants, which creates the background drone sounds which underpin the flights of fancy of star singers and instrumentalists. Fervent defenders of the importance of the carefully tuned tanpuras, a large part of their talk was given to a blistering attack on the upstart, non-traditional harmonium, which has become commonplace, indeed increasingly ubiquitous, in Indian music concerts. Another contender for the active supporting role is the sarangi, which I have always enjoyed as against the harmonium since the days of the great Ram Narayan, whom we used to hear in London often - q.v. the notes with his recital on Nimbus CD NI 5245 . He, almost single-handedly, raised the sarangi from near oblivion (somewhat akin to what Shiv Kumar Sharma did to elevate the santoor). The sarangi doesn't "drown" the tanpura as so often does the harmonium, and its exponents can convey exactly the 22 shrutis, as against 12 notes to an octave of the western tempered scale. The last of the educational events, and certainly the oddest, was in some ways the most rewarding. Neyveli Venkatesh demonstrated and lectured on the Kanjira, an untuned percussion instrument like a small tambourine. Made from jack-fruit wood and chameleon skin, it needs to be fed with water to bring out the bass tones which are possible. Venkatesh showed us, first as a "syllable artist" and then on the kanjira (played with the fingers of one hand) and finally on the double-ended mridangam, how rhythmic complexities of extreme degree are built up from simple mathematical multiplcations of basic sequences of increasing numbers of beats. 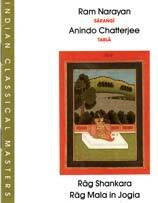 He had us join in, and it was possible to follow the easier stages in a way which was far more accessible to Western trained musicians than are the equivalent mysteries of precise tuning of particular notes in different ragas, adapted to the "comfort" register of a singer, so that vocal strain is prevented. By way of final comment, whilst greatly approving its celebration of English born Indians' preservation of their classical music tradition, maintained against considerable odds and pressures, we deplore what comes across as an inward looking stance of this admirable festival. There can be no doubting that the instrumental playing, and even more particularly the singing heard during these days at Kings Place, was a match for any artistry to be heard from Western musical stars, but much remains to be done to get that across, and Darbar is well placed to further that sharing of their very accessible and readily enjoyable music in England's multi-national society. P.S. Excerpt from review of Darbar Festival 2009: I apologise for labouring my concern about the amplification problem, but this is bound to alienate prospective audience members who regularly go to chamber music concerts in London. It has certainly caused us to attend Indian music events less often than in the mid decades of the last century - - If it is hoped to increase attendances beyond the Asian community the issue should be re-considered carefully before bringing Darbar back to London next year? - - I conclude with a comment from a leading London music editor and critic: I was surprised to learn from you that amplification was used, even including speech, for a Purcell Room concert ! This would seem wholly unnecessary given that the venue is relatively small and the sound carries effortlessly - - I imagine the volume of sound would have been irritating.